But the thing is, I’m not sure what to turn them into. This is where I want your advice! What type of product would appeal to you the most? What would catch your eye? What would you be most likely to purchase? T-Shirts, Jumpers, Pocket Mirrors… Fashion. It’d be really helpful if you could let me know in the comments below! I’d really appreciate it! I might start a poll on Facebook too. Head over to the first Handmade Monday of 2013 for lots more crafty blogs and posts! ← 3 Goals For The Year! Your designs would look lovely on notebooks and pads. Or how about decorative tiles? You know the ones you hang on the wall rather than stick on the wall? 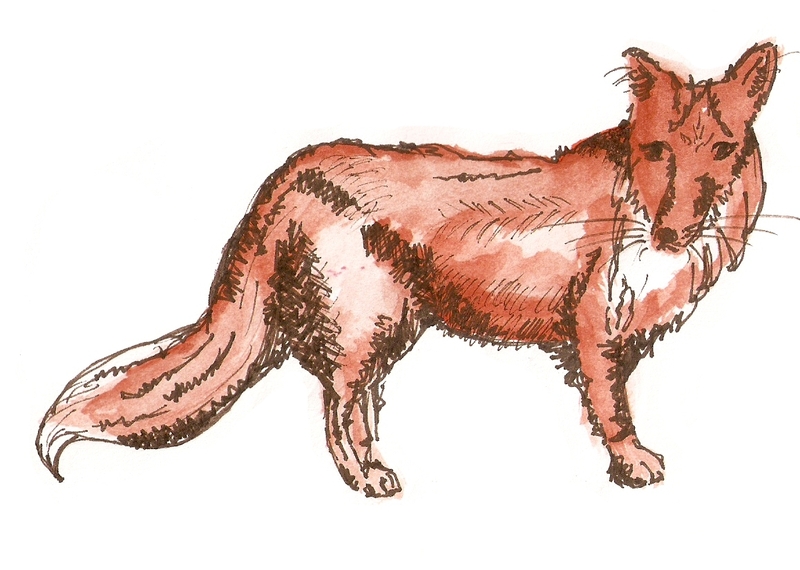 Love the fox & the cat, I think they would look great on stationary too ! They would look great on a mug as well . Well done – you’re very talented! These are lovely images – how about lists – the sort that you hang on walls (not very clear I’m sorry.) Good luck, I am looking forward to see what you decide on. Thanks – I hope you like whatever I end up picking! I am sure I will – the sketches are lovely. I would love the fox as a small necklace pendant. Now that’s something you don’t see everyday and it could be very eye-catching! I really like the fox and cat. I like your idea of pocket mirrors. They’d be so much prettier to get out of a bag than a standard compact. I particularly like the cat – the simplicity really works. I’m not much help with ideas for on what though as I can see it appearing on almost anything! Stationery seems a good idea as that gets used up and may need a repeat buy!! Well, the fox caught my eye. My son and his wife are big fans of foxes and they love things with foxes for their new son (9 months old now). It’s a little difficult to find foxes (not impossible but they are not as common as elephants etc). Your’s is very nice! So…. I seriously would buy something with that fox or a similar one on it that would suitable for a little boy. A mug and plate (or bowl?) might be really cute (I live in the US so is that an issue?) Listen to me, I’m such a Grandma…. Oooh, interesting 🙂 I love foxes too but I guess you don’t see many things with them on! I’ll definitely keep you posted on what I choose to use the images on!